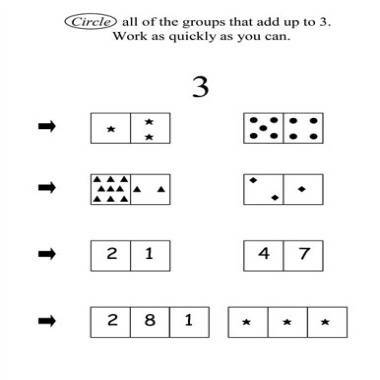 This illustration is part of a University of Missouri study that examined first-graders' "number system knowledge. We know a lot about how babies learn to talk, and youngsters learn to read. Now scientists are unraveling the earliest building blocks of math — and what children know about numbers as they begin first grade seems to play a big role in how well they do everyday calculations later on. There's other evidence that math matters early in life. Numerous studies with young babies and a variety of animals show that a related ability — to estimate numbers without counting — is intuitive, sort of hard-wired in the brain, says Mann Koepke, of NIH's National Institute of Child Health and Human Development. That's the ability that lets you choose the shortest grocery check-out line at a glance, or that guides a bird to the bush with the most berries. -- Don't teach your toddler to count solely by reciting numbers. Attach numbers to a noun — "Here are five crayons: One crayon, two crayons..." or say "I need to buy two yogurts" as you pick them from the store shelf — so they'll absorb the quantity concept. -- Talk about distance: How many steps to your ball? The swing is farther away; it takes more steps. -- Describe shapes: The ellipse is round like a circle but flatter.